and/or a Symposium on satellite techniques (including digital communications) prior to the AMSAT annual meeting. Tom needs input into this one, as well as participation from the rest of the country read between the 1ines, we need your participation'). Lastly, Tom is one of us - a packeteer. He is going to be instrumental in the planning, and allocation of AMSAT resources to satellite packet radio activity. Let's try to get him on prnet. How about it? Re your msgs of May 19.
a. In PR Docket No. 81-699, RM-3788, the FCC proposed that "Sending speeds as great as 19.6 kbps may be utilized on those frequencies between 50 and 225 MHz provided that the bandwidth of such emissions does not exceed 16 kHz." b. AMRAD's comments which were filed January 12, 1982 recommended that between 220.5 and 221.9 MHz the speed limit be raised to 56 kb/s. 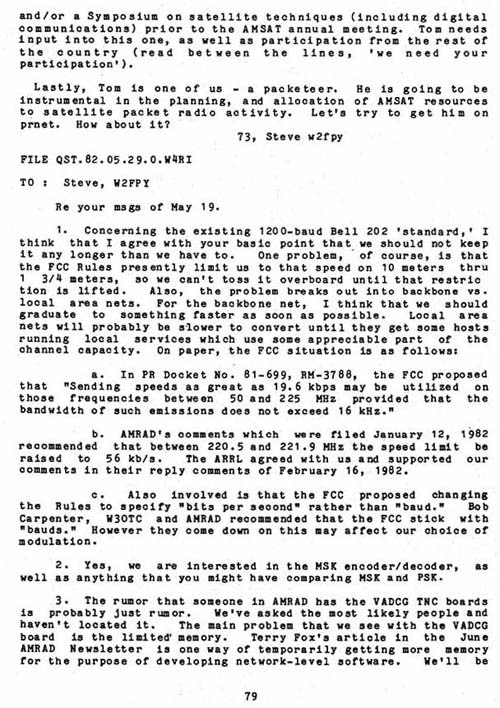 The ARRL agreed with us and supported our comments in their reply comments of February 16, 1982.
c. Also involved is that the FCC proposed changing the Rules to specify "bits per second" rather than "baud." Bob Carpenter, W3OTC and AMRAD recommended that the FCC stick with "bauds.11 However they come down on this may affect our choice of modulation. 2. Yes, we are interested in the MSK encoder/decoder, as well as anything that you might have comparing MSK and PSK.